This is a proprietary Morningstar data point. The Morningstar Style Box is a nine-square grid that provides a graphical representation of the "investment style" of stocks and mutual funds. For stocks and stock funds, it classifies securities according to market capitalization (the vertical axis) and growth and value factors (the horizontal axis). Fixed income funds are classified according to credit quality (the vertical axis) and sensitivity to changes in interest rates (the horizontal axis). By providing an easy-to-understand visual representation of stock and fund characteristics, the Morningstar Style Box allows for informed comparisons and portfolio construction based on actual holdings, as opposed to assumptions based on a fund's name or how it is marketed. The Style Box also forms the basis for Morningstar's style-based fund categories and market indexes. The vertical axis of the Style Box defines three size categories, or capitalization bands-small, mid-size, and large. The horizontal axis defines three style categories. Two of these categories, "value" and "growth," are common to both stocks and funds. However, for stocks, the central column of the style box represents the core style (those stocks for which neither value or growth characteristics dominate); for funds, it represents the blend style (a mixture of growth and value stocks or mostly core stocks). Style Box assignments begin at the individual stock level. Morningstar determines the investment style of each individual stock in its database. Stocks are evaluated against other stocks in the same geographic area (United States, Latin America, Canada, Europe, Japan, Asia ex-Japan, Australia/New Zealand). The style attributes of individual stocks are then used to determine the style classification of stock mutual funds. Growth and value characteristics for each individual stock are compared to those of other stocks within the same capitalization band and are scored from zero to 100 for both value and growth. To determine the overall style score, the value score is subtracted from the growth score. The resulting number can range from 100 (for low-yield, extremely growth-oriented stocks) to -100 (high-yield, low-growth stocks). A stock is classified as growth if the net score equals or exceeds the "growth threshold" (normally about 25 for large-cap stocks). It is deemed value if its score equals or falls below the "value threshold "(normally about -15 for large-cap stocks). And if the score lies between the two thresholds, the stock is classified as "core." The thresholds between value, core, and growth stocks vary to some degree over time, as the distribution of stock styles changes in the market. However, on average, the three stock styles each account for approximately one third of the total free float in each size category. Rather than a fixed number of "large cap"or "small cap" stocks, Morningstar uses a flexible system that isn't adversely affected by overall movements in the market. Large-cap stocks are defined as the group that accounts for the top 70% of the capitalization of each geographic area; mid-cap stocks represent the next 20%; and small-cap stocks represent the balance. A stock fund is an aggregation of individual stocks and its style is determined by the style assignments of the stocks it owns. By plotting all of a fund's stocks on the stock style grid, the range of stock styles included in the fund immediately becomes apparent. An asset-weighted average of the underlying stocks' style and size scores determines a fund's placement in the Style Box. Style box assignments for stocks are updated each month. Assignments for funds are recalculated whenever Morningstar receives updated portfolio holdings for the fund. In general, a growth-oriented fund will hold the stocks of companies that the portfolio manager believes will increase earnings faster than the rest of the market. A value-oriented fund contains mostly stocks the manager thinks are currently undervalued in price and will eventually see their worth recognized by the market. A blend fund might be a mix of growth stocks and value stocks, or it may contain stocks that exhibit both characteristics. Understanding how different types of stocks behave is crucial for building a diversified, style-controlled portfolio of stocks or mutual funds. The Morningstar Style Box helps investors construct portfolios based on the characteristics-the style factors-of all the stocks and funds that portfolio includes. The model for the fixed income style box is based on the two pillars of fixed-income performance: interest-rate sensitivity and credit quality. 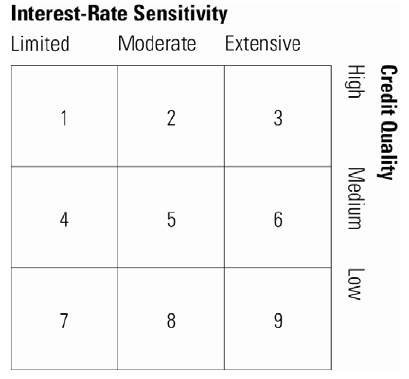 As depicted in the image below, the three interest sensitivity groups are limited, moderate and extensive and the three credit quality groups are high, medium and low. These groupings display a portfolio's effective duration and third party credit ratings to provide an overall representation of the fund's risk orientation given the sensitivity to interest rate and credit rating of bonds in the portfolio. Prior to October 2009, US taxable-bond funds with durations of 3.5 years or less were considered short-term (having limited sensitivity to interest rate change); more than 3.5 years but less than 6 years were considered intermediate term (having moderate sensitivity to interest rate change); and more than 6 years were considered longer term (having extensive sensitivity to interest rate change). In October 2009, Morningstar moved from the aforementioned static breakpoints to dynamic breakpoints. On a monthly basis Morningstar calculates duration breakpoints based around the 3 year effective duration of the Morningstar Core Bond Index (MCBI). Limited: To be placed in the limited section of the fixed income style box the fund's three year average effective duration needs to fall under 75% of the three year average effective duration of the MCBI (Morningstar Core Bond Index). For example, if the three year average of the MCBI = 5.935, limited funds would have a three year average effective duration < 4.45. These funds have limited sensitivity to interest rate change. Moderate: To be placed in the moderate section of the fixed income style box the fund's three year average effective duration needs to fall between 75% and 125% of the three year average effective duration of the MCBI (Morningstar Core Bond Index). For example, if the three year average of the MCBI = 5.935, moderate funds would have a three year average effective duration >=4.45 and < 7.42. These funds have moderate sensitivity to interest rate change. Extensive: To be placed in the extensive section of the fixed income style box the fund's three year average effective duration needs to fall above 125% of the three year average effective duration of the MCBI (Morningstar Core Bond Index). For example, if the three year average of the MCBI = 5.935, extensive funds would have a three year average effective duration >=7.42. These funds have extensive sensitivity to interest rate change. By using the MCBI as the duration benchmark, Morningstar is letting the effective duration bands to fluctuate in lock-steps with the market which will minimize market-driven style box changes. Municipal bond funds with duration of 4.5 years or less qualify as low; more than 4.5 years but less than 7 years, medium; and more than 7 years, high. Historically, Morningstar followed the industry practice of reporting the average credit rating of a bond portfolio by taking a weighted average of ratings based on data provided by the fund company. However, because the default rates increase at an increasing rate between grades (a mathematical property called convexity), this method systematically understated the average default rate of a bond portfolio. For example, for U.S. corporate bonds as of the date of this document, the spread in default rates between CCC and BBB rated bonds was over 21 times that of the default rate spread between BBB and AAA bonds. Yet, the conventional method assumes that these spreads are equal. To see the impact of this, consider a portfolio of 90% AAA bonds and 10% CCC bonds. According to the conventional method, the average credit rating of this portfolio is AA. However, the average default rate for this portfolio is that of BB bonds. To correct this bias, Morningstar takes the convexity of default rate curves into account when calculating the average credit rating of a portfolio. The first step is to map the grades of a portfolio's constituents into relative default rates using a convex curve. Next, average the resulting default rates (rather than the grades) to come up with an average default rate for the portfolio. Finally, using the same convex curve Morningstar maps the resulting average default rate back into a grade. For example, a portfolio of 90% AAA bonds and 10% CCC bonds will have an average credit rating of BB under this new methodology. Independent research confirms that the arithmetic average credit rating of a bond portfolio systematically understates the credit risk and that a more meaningful measure would be to average the default probabilities associated with each letter grade and then use the convex curve that relates the numerical representation of the letter grades to default probability to assign a letter or alphanumeric rating to the portfolio. This procedure is detailed in Appendix A. The data which drives the fixed income style box is surveyed from fund companies. Morningstar asks fund companies to send the following information on a monthly or quarterly basis for each of their fixed income or allocation funds. For hybrid funds, both equity and fixed-income style boxes appear. How do I subscribe to Stockstream?